As one of its projects to commemorate the 100th anniversary of the Civil War, the North Carolina Confederate Centennial Commission initiated, and the North Carolina Office of Archives and History has continued, the compilation and publication of a new, comprehensive roster of all North Carolinians who served during the war. When completed, this series will comprise approximately 22 individually indexed volumes and contain the names and service records of approximately 120,000 soldiers. 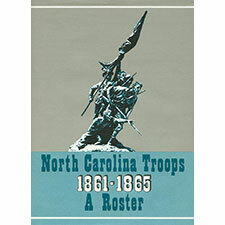 The rosters contained in each volume are arranged numerically by regiment or battalion and then alphabetically by company, and each roster is preceded by a unit history. Officers and enlisted men are then listed in separate sections, the arrangement being (with a few exceptions) alphabetical by surname. Each name is followed by a service record that includes information such as the soldier’s county of birth and residence; his age and occupation at time of enlistment; promotions; whether he was wounded, captured or killed; and whether he deserted or died of disease. any information relating to his service in the war. Please include the company and regiment in which the soldier served, and please include your source of information. We can only include in our series information we deem to be reliable. If you are so fortunate as to have an original document relating to someone’s service in the Civil War, such as a letter or diary or official document, we would appreciate it if you would contact Matthew Brown, especially if the document relates to a soldier serving in a unit for which we have not yet published a roster. By sharing with us a copy of such a document, you can contribute to North Carolina history! To view the roster please open the below link in a microsoft explorer browser window otherwise it will not open in any other browser. We are currently working to correct the issue. Many thanks!